What does the polygnostic say? I say that I know gods exist; I interact with them daily. In fact, I’ve had divine presences in my life from the time I was very young, when I found them in the stories of my childhood, video games in particular. Before I knew they were gods—before I knew that they were allowed to be considered gods, in the midst of religious monopolies on the divine and atheistic theophobia—I meditated on them, and prayed to them. I worshipped them in my own way. Sometimes they took physical forms, as elements of the natural world like mountains or gusts of wind, and when they did I would treat them like my closest friends. I would lean on them, when they offered me their shoulders, and I would dance with them. Sometimes they even acted in the natural world, and I came to attribute certain physical occurrences to their involvement. When I discovered that I was allowed to call these gods what they were to me, and they were indeed gods, I did so gratefully. It was a relief to be able to treat them as I’d wanted for so long to treat them. I’ve called them gods ever since, worshipped them, prayed to them, and found my way with their help. I’ve also discovered that my perceptions of gods, and my interactions with my gods, are not all that unique or strange in the grand scheme of world religions and historical divinities, and that people have been having experiences akin to mine for millennia. I know that gods exist, but I also know that I cannot present my gods for scientific evaluation. I know that not everybody experiences the same gods as me. Even when I perceive them to act in a way which changes the physical landscape, I know that I cannot insist that others agree with me in attributing events to their wills. I know that I cannot and should not ever do that, because even while I have personal gnosis—my own vivid experiences and understanding of divinities—I’m simultaneously an agnostic in that I cannot even begin to be certain about whether my experiences indicate any objective or physical divinity. Personal gnosis and agnosticism exist simultaneously for me. I can be both certain about the existence of my gods and uncertain about all of the reasons I perceive them, and because I respect the indispensable advancements which have only been made thanks to scientific evaluation of the natural world I will defer to science to determine the mechanisms by which the physical world works. However, I will continue to develop my personal gnosis in a way which helps me to find fulfillment through my divinities, fulfillment which only they may be able to provide. I will continue to seek them and delve into them, even while I must remain uncertain as to their absolute natures. This entry was posted in Uncategorized and tagged agnostic, agnosticism, atheism, divinity, gods, humanism, humanist, interfaith, personal gnosis, polygnostic, polygnosticism, religion, the divine, theism, theology on January 4, 2014 by stranger. Welcome! Sorry I wasn’t able to comment more on it– I’ve been low on free time lately! 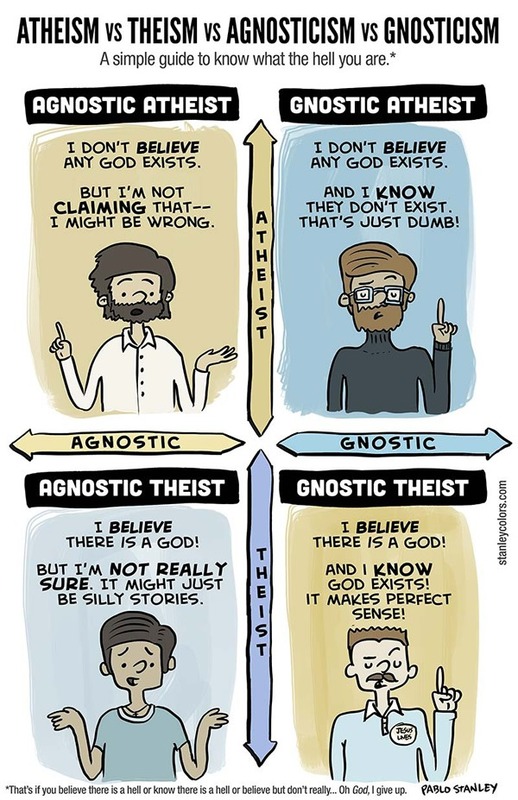 I’ve heard of the four way distinction between agnostic atheist, agnostic theist, gnostic atheist, and gnostic theist before, and I think it’s legitimate. However, there is another legitimate way of distinguishing between these positions. It’s based on the distinction between affirming a claim, suspending judgment about a claim, and denying a claim. Affirming a claim means you believe it, although not necessarily that you believe it with certainty. Suspending judgment about a claim means that you don’t believe either that the claim is true or that the claim is false; you’re neutral with respect to it. Denying a claim means you hold the positive belief that the claim is false, although you might not believe that it is false with certainty. If we apply this distinction to the claim that God exists, we get the alternatives of affirming that God exists (theism), suspending judgment about whether or not God exists (agnosticism), and denying that God exists (atheism). I think both of these sets of distinctions are in wide use and have roughly equal utility, so I don’t see any way of reasonably demanding that someone who uses one set of distinctions use the other set..